What we mean by a comprehensive eye health examination is a detailed and complete evaluation of the health of each area of the eyes. We provide a thorough assessment of your vision and ensure your eyes are working together as a team. Personalized recommendations are made based on your visual and health needs. Our doctor and clinical technicians explain the purpose of each test as it is performed. We want to help you understand all your eye health and vision treatment options. During the exam, pressure in the eye is measured to see if there are any early signs of glaucoma. In addition, the back of the eye, including the retina, macula, and ocular nerve are examined for signs of disease and problems such as macular degeneration, diabetic retinopathy, and retinal holes/tears or detachments. Observation of the back of the eye is performed either through dilation of the pupils or by taking an Optomap retinal scan (there is a separate fee for the Optomap retinal scan). The doctor performs refractive testing to determine the optical lens strength required for the clearest possible vision. Binocular vision skills are tested as well; this is to ensure that the eyes work together properly as a unit. These skills include depth perception, eye muscle coordination and the ability to change focus from near to far objects. Binocular vision skills are especially important to asses in children during a children eye exam because they are necessary for good school performance. Pupil responses are tested, and the cornea and lens are checked for general health and the possible development of cataracts. We Can Help With Dry Eye Exams and Treatment. New clients and all our current patients from Hamilton, Corvallis, Darby, Stevensville, Victor, and Pinesdale, MT are welcome to visit us with their current prescription - no appointment necessary. It is important to have a comprehensive eye exam every 12 months. Getting your prescription checked by your doctor is the best way to keep your eye wear current and your eyes in good health. Eye diseases such as glaucoma display no symptoms until full onset has occurred; this is a disease that can be prevented through detection and maintenance. In addition, prescription changes do not necessarily reveal themselves through secondary symptoms. Changes in the amount of myopia (near-sightedness) or hyperopia (far-sightedness) occurring can be masked by the eye muscles straining to accommodate for the change. This does not always reveal itself by way of headaches or noticeable eye strain. Undiagnosed pediatric vision conditions may impact learning and cause developmental delays. It’s critical to identify any visual problems as early as possible. 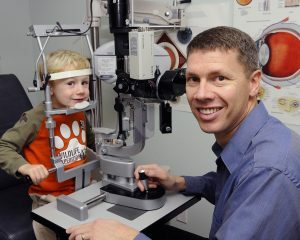 With a gentle and experienced manner, our eye doctor is highly skilled at checking kids’ eyes.